As I’ve suggested before, Vincent van Gogh’s work was much more varied and diverse than most books on the artist, which tend to take the safe path of presenting his “greatest hits” over and over, would lead you to believe. Van Gogh: Up Close, an exhibition that is toward the end of its run at the Philadelphia Museum of Art and then moves to the National Gallery of Canada in Ottawa, focuses attention on a range of his lesser known works, primarily from the later part of his career and with a theme of intimate subjects, both landscape and still life. There are still examples of his sweeping views of fields and farms, but also the less frequently seen subjects of “sous bois” (undergrowth) paintings, which immediately became favorites of mine, and his remarkable paintings of simple grasses, in which he sees subjects where other artists might see nothing of interest. And though the famous sunflowers are represented by the Philadelphia Museum’s iconic piece of the golden topped vase, and the Metropolitan Museum of Art’s sunflower blossoms as still life, there are also still life paintings different from those we are used to seeing. Van Gogh’s strikingly textural use of paint is evident in several pieces, brush strokes that are so three dimensional they look as though they were just laid down, a characteristic often evident in his more famous works. One of the things that struck me, however, in comparing these paintings to many of his more well known works, was his use of directional strokes. Van Gogh, whether intentionally or as a byproduct of his efforts to express what he saw, was a master of the application of brushstrokes that move across and around forms, through skies and backgrounds and lead your eye through his paintings in a way quite unlike any other artist. These effects are frequently combined with his remarkable tendency to mix outlines and other elements of drawing into his paintings. Even in a simple still life subject of apples, grapes and pears, in which any other artist would have painted the highlights on grapes with a simple horizontal stroke of lighter color, Van Gogh has used a vertical hatching of strokes to define them, imparting a fascinating textural quality — but not for a moment reducing their presence as grapes. In other images his strokes point toward the focal point of the painting, leading you in like a Photoshop Zoom filter. Somehow these elements captured my attention more in these works in which he also played with focus and depth of field and frequently portrayed distant and close objects in the same scene. The Philadelphia Museum of Art does not have much of a selection of images from the show on their website, but the National Gallery of Canada does. On this page, the National Gallery has been posting a new image from the show every week, to continue up to the opening on May 25. As of this writing they are up to 21 images. (Click on images to view larger versions.) I’ve also linked below to a few images not yet posted that I made note of and looked up elsewhere. There is also a book from the exhibition, available from the Philadelphia Museum and the National gallery, as well as Amazon and other booksellers. Van Gogh: Up Close is on display at the Philadelphia Museum of Art until May 6 (timed paid or member tickets required, but some are still available according to the website). It moves to the National Gallery of Canada where it will be on display from 25 May to 3 September, 2012. Van Gogh is an artist for whom many misconceptions and popular assumptions, and the very brilliance of his fame, often obscure the actual artist. Van Gogh: Up Close, by focusing on less familiar works and more intimate ones as well, gets us a bit closer to Vincent van Gogh, the painter. 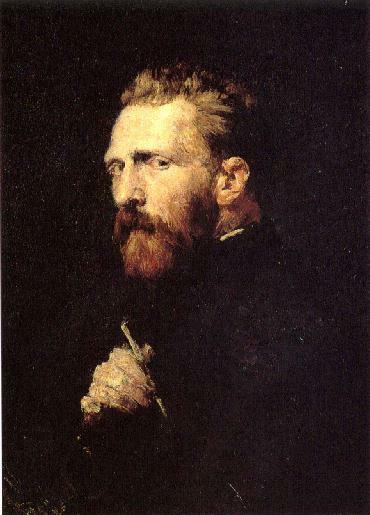 Van Gogh’s paint application is closely related to his drawing technique, based on hash marks, widely used in etchings of the time. The Met had an exhibit of his drawings a few years back which showed the close resemblance of many of his drawn images to his painted ones. Sometimes he drew an image then painted it. At other times he painted it and then drew it, often to send the drawing to Theo, his brother. Australian artist John Peter Russell’s head studies in pencil of Vincent are awesome. The portrait in oil is perfect. Don’t you wish we could ask him about it? So many misconceptions, too bad he can’t speak for himself but oh how his work prompts much conversation by those who view it. The van Gogh Museum has posted a superb resource: Vincent van Gogh: The Letters, in which the letters are presented in both facsimile versions, with close ups of drawings and sketches, and in text and translated versions, indexed and searchable. See also my post on Van Gogh’s letters for more links and information. Wow this is very, really, extremely informative.